The traditional method of education has been “chalk and talk.” Literally, it means that the teacher will illustrate a concept with a chalk and talk about it loud enough for the whole class to hear. In this form of direct instruction, the teacher controls the learning environment for the whole class and the students are recipients. The teacher writes down learning instructions on the board and speaks aloud in the class explaining those concepts. There is one teacher for many students and children learn through drill and practice method. The emphasis is on test performance and grades. The method relies heavily on the abilities of the teacher. That means if the teacher speaks in a monotonous tone there is a probability that the lecture might get boring for the child and the child will lose interest in it. Consequently, s/he will not be able to grasp the concepts that are being taught in the class. The solution is to make learning engaging. Audio-visual technology entered the classrooms in the form of a TV and video player to show short educational films. The objective was to make the learning experience engaging for the child and expose them to the technology at the same time. However, in the hindsight the AV (Audio Visual) labs were used sparingly and under strict supervision. Also, the AV experience didn’t integrate seamlessly in the school curriculum. Rather, it was enforced! Hence, the student was not engaged and the teacher continued with the ‘chalk and talk’ technique. The next step was smart boards. These smart boards had diagram drawers which were handy in explaining complex nuances like DNA replication or block mountain formation. The flaw with smart boards were that they required electricity and internet for use. That meant in the interior parts of India the smart boards were of little help. Also, somewhere smart boards lacked in providing pro-active after sales support. Moreover, smart boards tried to compensate for teacher’s lacunae through intelligent teaching icons before the teacher commences teaching. Somehow, it went against India’s traditional culture where learning is always acquired through the Guru. The technology at the best could support but the teacher remained important. Online teaching was structured around this premise. The teacher was the focal point and the technology was there to fill in the gaps. It succeeded in bringing learning closer for students in far-flung areas, but beyond that it didn’t work. Online teaching was heavily tilted towards the student. So, if the student was a keen learner online teaching helped and if the student was not such a keen learner, it would not. Ultimately, learning is always imparted by the teacher. Therefore, at YouDo we felt the need to create educational aids that focused on the teacher. For us it is going back to the basics and reviving the Gurukul culture of India. At best, our educational aids support the teacher in explaining a concept but it’s the teacher who is always at the centre stage. 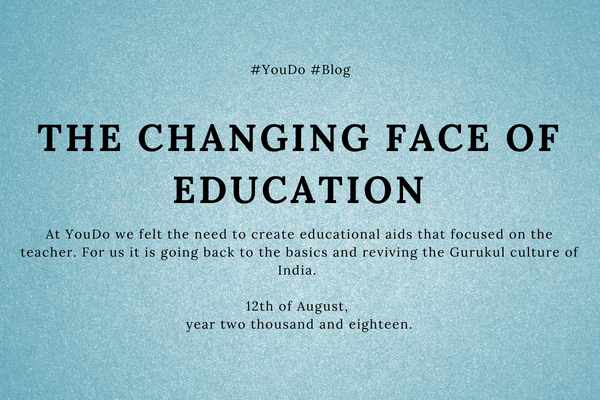 When we create a product or a learning device at YouDo, we try to mitigate apprehensions of our stakeholders – students, parents and teachers. These educational aids help the teachers clarify doubts on tricky concepts and theorems in a simple and fun way through experiential learning. The student gets to experiment in the presence of the teacher or on her own and gets to understand the concept in a better way. That clarifies the doubts of the students and reassures the parents. Moreover, understanding concepts also mitigates the peer -pressure and the resulting competition among students, which is so ingrained in our education system. For teachers, our educational kits help cater to each child in a unique way, so that they could clear their apprehensions without being overbearing.